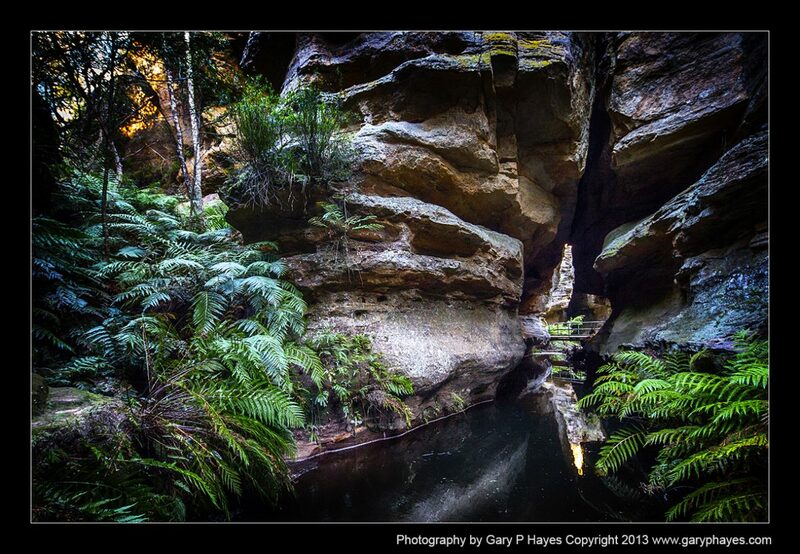 ABOUT: Although the massive Walls Cave is at the end of this short trail and is very impressive & has good aboriginal heritage the more photogenic area is the small canyon just before you get to it. A pool, stepping stones & views of ferns and a slot canyon are worth exploring. PHOTO EQUIPMENT TO BRING: A few small trails so pack light. A 20mm wide should provide good coverage of the slots, but the dynamic range of the light with mean a good tripod and some blending perhaps. GETTING TO THE SPOT/S: Park on the Evan’s Lookout Road parking area and it is about a 20-30 minute walk down a gradual hill. To get into the canyon areas some rock scrambling may be necessary depending on time of year.